Walter Allan Meyers died of natural causes on 26 March 2019 at the age of 84. He was born 31 December 1934 in Cleveland Ohio. Walter Alfred Meyers and Darcy Lucille Meyers raised their son Walt and his two younger siblings Gary and Darlene in Whittier California during the Great Depression. Walt would try to help by making money any way he could. During high school he would go to school during the day and work the night shift at the local drug store. A dedicated family man who always tried to be there for family when he wasn’t on the road making money. He loved to write poetry and sing for his lady. His first wife Evelyn Ballard and him had four children during their 40 years together. He tried to do special things with each of his kids. He would take Eve to kindergarten on his motorcycle. Allan and John loved having motor cross in the front yard. Robert, being much younger learned how to run a business. His brother Gary would get overly stressed when it was time for Gary’s wife Barbara to give birth. Gary asked his big brother for help. Walt was there for each of Barbara’s seven deliveries. Walt was always busy trying to do something. He would push himself until his internal battery would quit. Many times, he would come home exhausted and be given a bowl of stew or chili for dinner. He would take it to the sofa or his chair in front of the T.V. and fall asleep. Sometimes he would take a bite before falling asleep with the full bowl on his lap. Walt was on the road a lot during the racing days. If you were in the car or van with him, there was one of four things happening. You were listening to a game on AM radio, singing a song like Maggie Murphy, or listening to one of his stories. He loved to talk about racing and would give lots of details. When you were listening to his stories you felt like you were there. More times than not, if he was telling a story, he would stop the story in mid-sentence when he realized he had missed his turn. There were a lot of laughs when you were in the car with him. While serving in the Army at Fort Lewis, Walt got interested in engines and was constantly trying to increase the performance of his Armored Personnel Carrier. In his 1980 book, So You Wanna Go Fast, he described himself as an engine nut. “I have to work on engines. I’d go batty if I couldn’t tinker with them and try to figure out how to make them faster.” As you likely already guessed, yes, he had the fastest Armored Personnel Carrier in the U.S. Army. Before the Army, Walt worked construction as a carpenter when work was available and as a repo man when that work was available. After the Army, Walt fell back into the same line of work. He soon found a fledgling go-kart racing circuit developing near him. The engine nut in him couldn’t stay away. Within a few years he was the 1967 International Karting Federation (IKF) National Champion. People flocked to him and wanted him to build their engines for them. 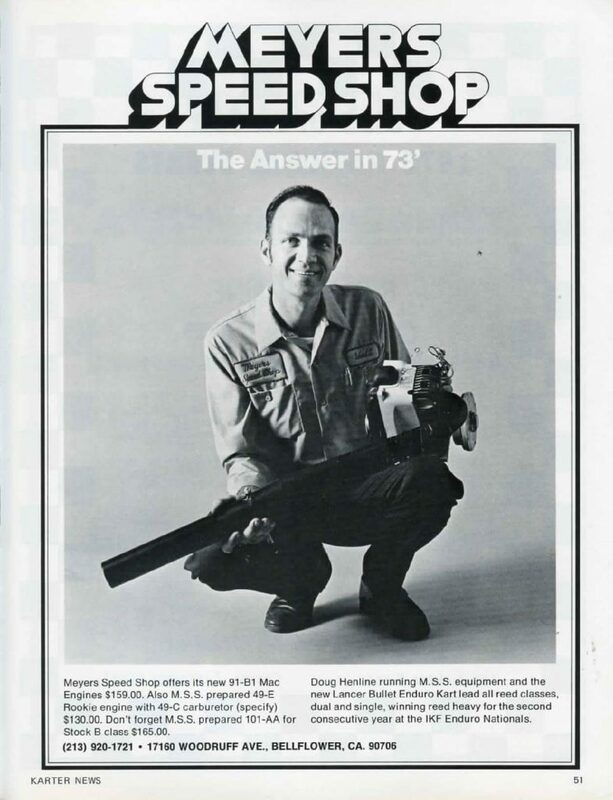 So, he opened Meyers Speed Shop, which later became Meyers Racing Engines. People in the racing world talk with others in the racing world. 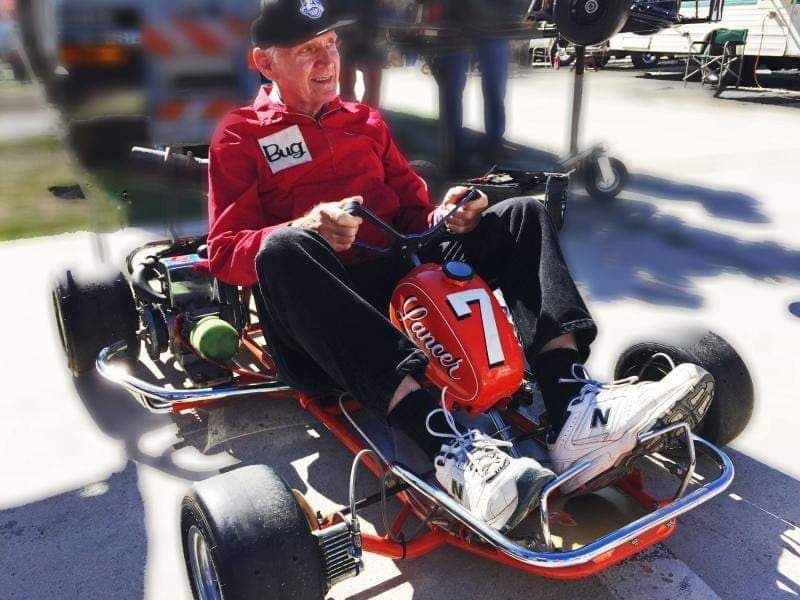 Walt would talk for hours on the phone with NASCAR greats Al Unser and Bobby Unser about how to go faster. This type of collaboration helped many customers to win race after race. Walt’s customers were regularly seen in the winner’s circle, which he published once a year for decades. His son, John, was the 1975, and 1976 IKF Grand National Champion and 1978 and 1985 IKF National Champion. The engine maker for the IKF Senior Grand National Champion is awarded the Master Mechanic Award and Walt won this multiple time. The IKF discontinued the practice after Walt won it too many times. Walt was known as a Master Mechanic who some thought it rained hard enough, he might be able to walk on water. Throughout Walt’s life he would invent his own math in order to solve problems others thought were impossible. When the Israeli Defense Force was looking for a small engine for a reconnaissance drone. Everyone said it could not be done to their specifications. Big names such as Yamaha, McCulloch, and Briggs and Stratton said if it was possible, Walt could do it. He asked them a question they had not been asked before. “How long does it need to last?” He created single use engines for them that without coolant that met their specifications. Walt designed Amago Raceway and the go-kart track at Perris Auto Speedway. He went all-in on financing Amago Raceway. He had a trusting nature and placed a high value on handshake agreements. Walt invented and patented a tire ring that improved tire performance and longevity. He also developed many of the safety components and rules for go-kart racing. Wally was an inventor, track designer, mechanic and writer. After Evelyn died in 1995 Walt met his second wife Francis, who brought out the cowboy in him. He enjoyed the different lifestyle. They lived up their golden years listening to the birds at their home in Wildomar with a tiki bar in the living room. Walt is survived by his four children: Eve Davis, Allan (Debbie) Meyers, John Meyers, and Robert (Telonda) Meyers. His ten grandchildren: Steve Meyers, Krysta Meyers, Allan (Kristine) Meyers, Sean (Robyn) Meyers, Melissa Meyers, Amber (Thomas) White, Sabrina Meyers, Carmen Davis, Jennifer Davis, Manuel Oceguerra. His twenty three great grandchildren: Elena, Alysia, Hector, Victor, Jaiden, Melody, Karl, Walter, Lucylia, Elvira, Arura, Oscar, Maxwell, Brandon, Kaedan, Haylee, Sadie, Nathan, Emily, Brittany, Adam, Colin and Mariah. Memorial Services will be held in San Diego on April 27th. If you knew Walter, please feel free to come as we share memories of him. Please tell the gate that you are here for the Walter Meyers Memorial, and the first 15 cars will have their parking taken care of for the event. Please note beyond that there will be a fee for parking. Thank you for helping us remember Walter.